1. In the first place: a postcard from a good friend. And since most people send messages by e-mail, I like it when I get some real post! 2. Fabrics! Because you know how it is: now that I have to work on party stuff for the upcoming birthday, the only things I feel like making are things that are not really necessary at the moment and don’t have anything to do with party things at all. So I ordered some fabrics. And so I made the bag today that’s already waiting for months to be made and wouldn’t have mind if it had to wait another month to be made. and is lined with dotted cotton. It has a cover inside made of the same dotted cotton. 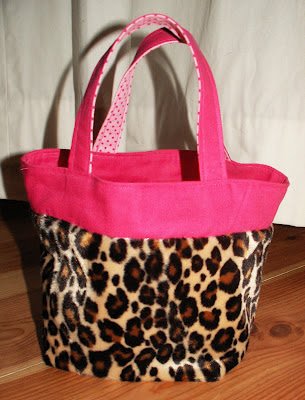 The tutorial for this little bag I found at a blog called Pink Penguin. Very nice tutorial with a lot of pictures to make it even easier to make! In the meantime I made all the clothes for myself I mentioned a couple of months ago (top, a dress, pencil skirt, another dress), except the cigarette pants. Maybe I make that one at the end of the summer, I just don’t feel like making pants at the moment. Instead of pants I felt more like sewing a blouse this time. 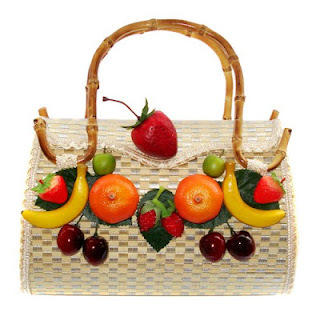 Three years ago I bought this little orange bag, made of raffia and pearl shell, in Key West, Florida. I loved the color and the materials, but never wore it ever since. I just didn’t have clothes that matched the color of the bag. But now I made me a blouse just to wear with the bag J ! This week my Vintage Dress is featured by Serenity You. Thanks, Natasha! And my Clay Gift Tags are featured by Threading My Way. Thank you, Pam! WANTED Always wanted a dress like this! Of course the butterflies ain't real; I would never cage something as beautiful as a fluttering butterfly. 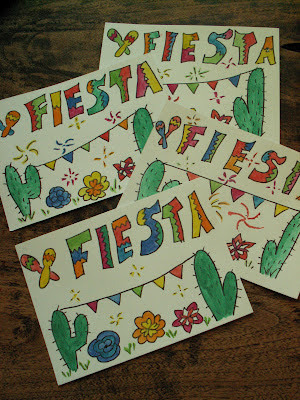 I’m very busy making the invitations for the upcoming birthday party (the design is finished and I already painted five invitations), so please don’t think there passed another week without any progress concerning the party, but again I was distracted by something else I wanted to make first J. 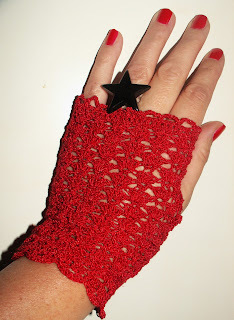 This time it was a pair of fingerless lace gloves. The inspiration for the gloves I found here (you can find A LOT of nice crochet patterns here, by the way), but in the end mine didn’t look at all like the ones in the pattern. The only thing I used from the pattern is the V-stitch and the Fan Stitch. I used a very thin yarn and the smallest crochet hook I could find, to make it look more like lace. And of course I used red yarn, 'cause red is my favorite color! Before I went on vacation a couple of weeks ago, I had a plan to make some clothes for myself instead of the usual dresses for my girls (although I made dresses for them, too). I wanted to make a top (check, see here), a skirt (check, see here), pants (still to make) and two dresses. The first dress I made a couple of weeks ago (so check, see here) and the second dress I finished today! This vintage pattern I saw in the july issue of Burda. I only changed some little things here and there in the contrasting lines. 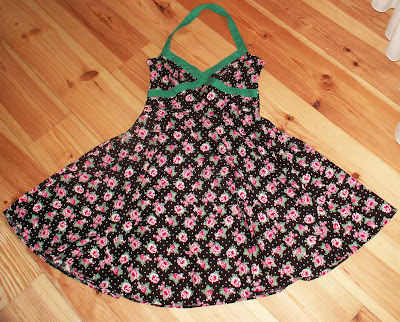 The dress I wanted to make initially was one with busks and things, but when I saw this one, I must have this one too. The one with the busks can wait till the next summer. Or maybe I'll make that one anyway in a couple of weeks. We'll see. 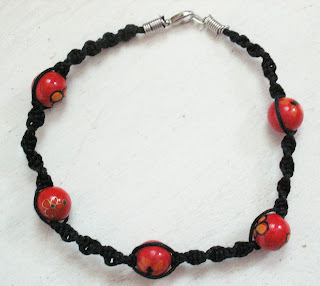 ~*~ This week my bracelet is featured by Blissful Bucket List. This week my daughter will have her last school day before summer vacation starts and by way to say thanks for their efforts this year, I made bracelets for her teachers. I really NEED this bag! Although I was planning to make some decoration for the upcoming birthday party or to make the clothes I started with before I went on vacation, this blog crossed my path and after that I had to crochet something with a spiral first. And if something really must be done but can't be too time consuming, the first thing I think about is a pillow. So I made a pillow J ! And doesn't it match quite well with this other pillow I made once? 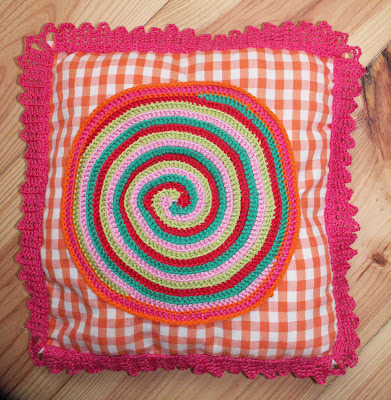 At the same blog you can find how to crochet a spiral (it's a blog in Dutch, but there's a translation button). The pattern of the crocheted edge of the pillow I found in a crochet book by Jan Eaton. This week my Polka Dot Dress is featured! Misty from Creative Itch as well as Megan from Brassy Apple featured my dress. Thank you both! Last week I already showed you I started to crochet this vanes, but now it's finished and I wrote a tutorial for it. Ch 8, sl st in the first stitch to form a ring. *Ch 10, sl st in ring, ch 7, sl st in ring*; repeat * *; ch 10, sl st in ring, chain 7, sl st in first ch of 10. You should have three spaces of 10 chains and three spaces of 7 chains now. Change color. Ch 3 (this counts as 1 dc) in 10 ch space, 3 dc in same pace, 3 dc in next space,* 4 dc in next space, ch 5, 4 dc in same space, 3 dc in next space*; repeat * *; 4 dc in next space, ch 5 and close with sl st in first ch3. Ch 6 (first three count as a dc), *dc in first space between three dc of third row, chain3, dc in next space, ch 3, 4dc in next space, ch 5, 4 dc in same space*; repeat * * twice; sl st in third of 6 ch.